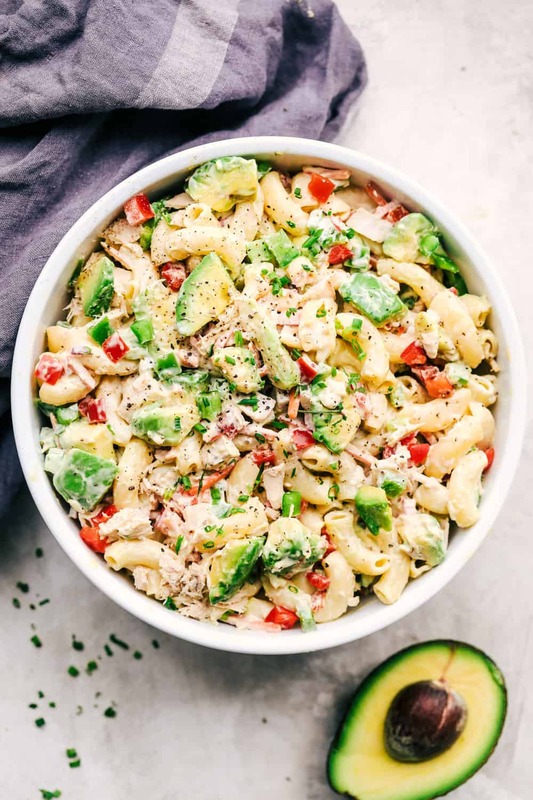 Tuna Avocado Macaroni Salad is an AMAZING creamy macaroni salad that is filled with chopped veggies, avocado, and tuna. This is going to impress everyone at your next potluck! If you love avocado as much as I do, here are some other great potluck options: Strawberry Avocado Salad, Avocado Shrimp Ceviche, or Avocado Basil Pasta. Holy moly this pasta salad is incredible. I feel like tuna and avocado goes together like peas and carrots. I eat tuna with avocado for my lunches at least 3 times a week. It is my favorite pairing together. 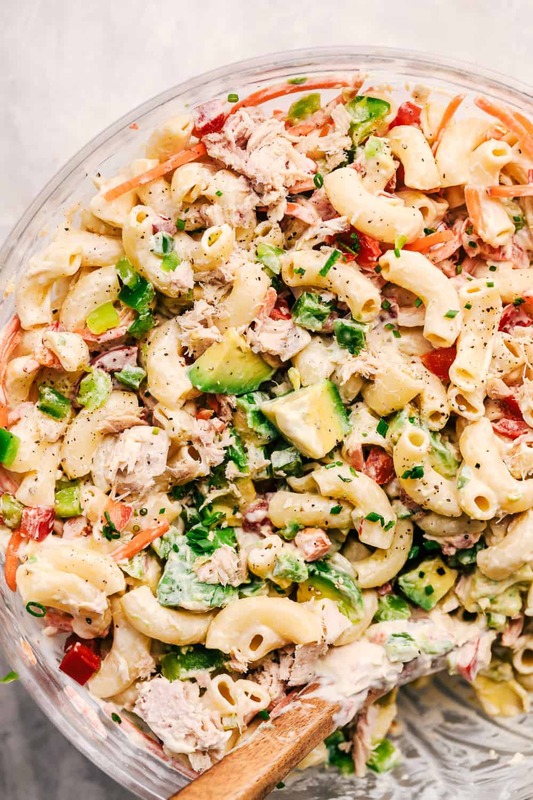 I was making this pasta salad and I thought to myself, how amazing would this salad be if I added tuna!? I love taking a good pasta salad dish to a potluck and macaroni salad is always a classic. But when you add fresh avocado and tuna, it takes it to a new and delicious level. I am telling you. This became a favorite with the very first bite! 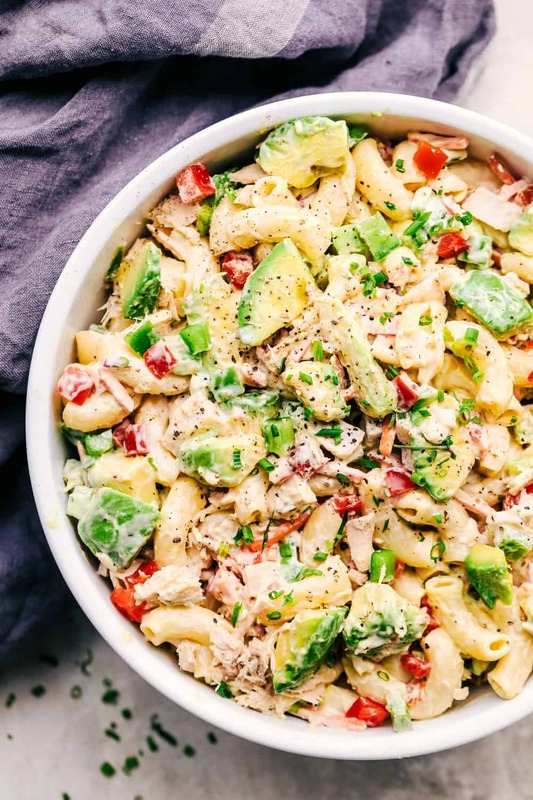 What is in tuna avocado pasta salad? How do you make a simple pasta salad? To start, bring a large pot of water to boil and add pasta and cook until al dente. Drain and rinse in cold water. In a large mixing bowl, add pasta, chopped veggies, tuna, avocado and creamy mayonnaise dressing until incorporated. Top with fresh cracked pepper and chopped chives if desired. What is a good substitute for mayonnaise in pasta salad? What goes with pasta salad for dinner? Grilled meat always goes well with pasta salad. But you can also include grilled corn, baked sweet potatoes, sliced tomatoes, asparagus, broccoli or baked beans. 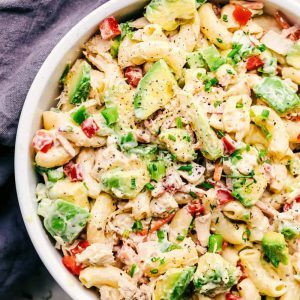 Tuna Avocado Macaroni Salad is an AMAZING macaroni salad that is filled with chopped veggies, avocado, and tuna. This is going to impress everyone at your next potluck! Bring a large pot to boil and add elbow macaroni. Cook until al dente and then rinse in a colander in cold water. 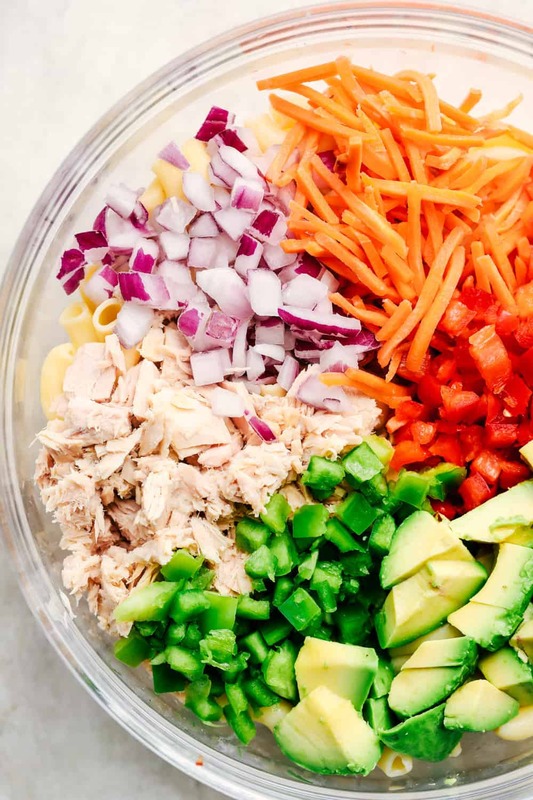 In a large bowl add pasta, tuna, carrots, red onion, bell peppers, and avocado. In a small bowl whisk mayonnaise, cider vinegar, sugar and dijon mustard. Pour over pasta and toss to coat. Garnish with fresh cracked salt and pepper and chopped chives if desired. Serve immediately or chilled, but add avocado in right before serving. It really could be a simple summer dinner once you add all that protein in there! Yum! I live in the West Indies, to be exact I’m from the island of Trinidad. This recipe looks so delicious, I can taste it. We are in the month of June, that’s the season for avocados and most of us enjoy them, I will certainly make this dish. It is exciting! I made this for dinner last night. Unfortunately, I had to leave out the bell pepper. My husband just can’t tolerate it. Even without the bell pepper, it was delicious. I did feel like it needed something else. Any suggestions as to what I can add to replace the bell pepper? I though about just a hint of chipolte or some other type of pepper. I will definitely be making this again. It would be nice to have the servings for a recipe. 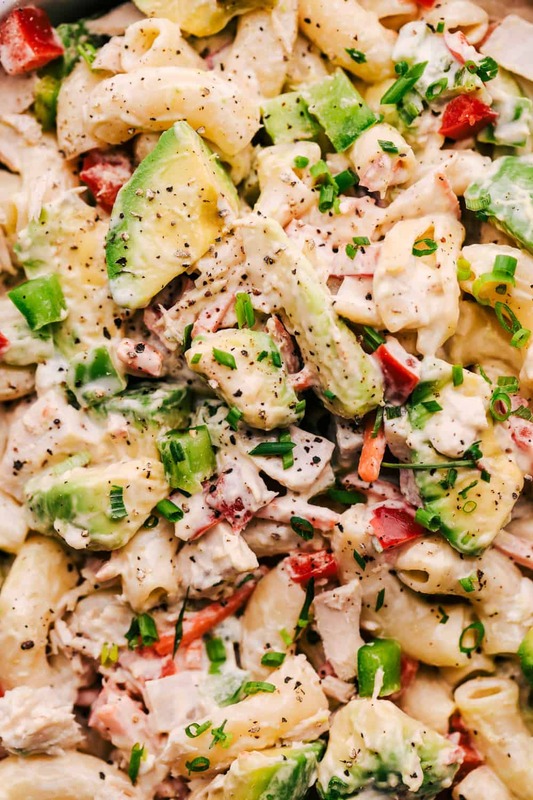 I love the Tuna Avocado Macaroni Salad but need to know how many it serves before I make it. This serves about 6 to 8 people. what are the calories and nutritional values on this recipe.